To create a serene family sanctuary that harmoniously connects inhabitants with the surrounding natural environment by combining the most sustainable, eco -friendly materials and energy efficient technologies with minimalist architectural design. 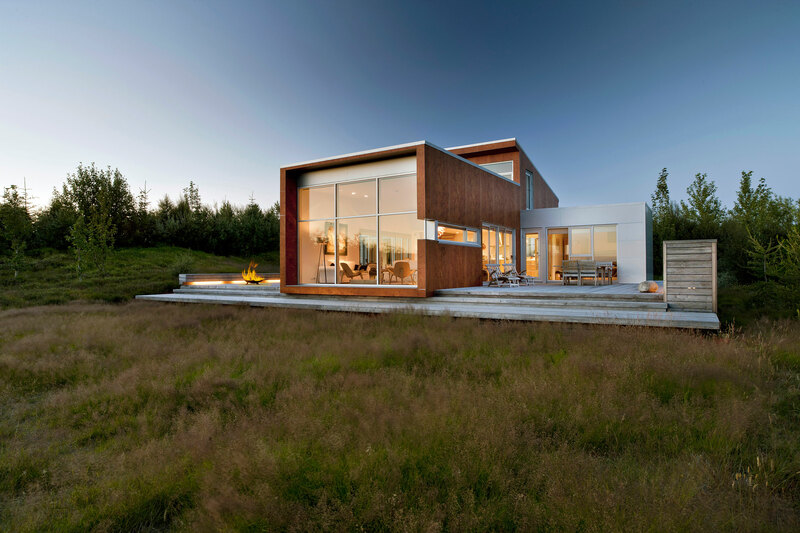 The house is located in the beautiful a rural town of Iceland, a low-developed region committed to the preservation of its beautiful natural scenery and resources. The design intent embodies Iceland’s respect for the environment, while many countries promote sustainable building; this is our heritage-our national ethos. Implements mnmMOD, a new construction technique developed by Minarc. 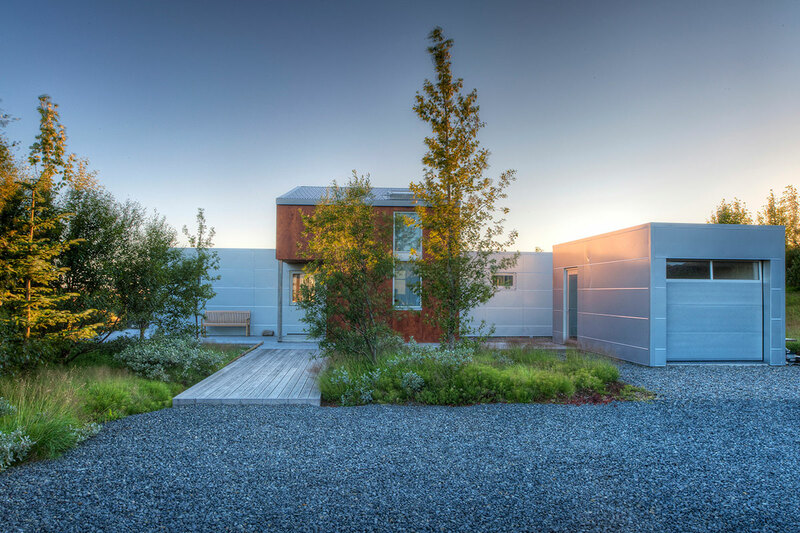 This modular building system brings the economy and waste-reduction of pre-fab to the elegance and infinite possibility of custom design. The home is a series of linked cubes serving program. Popping forward from a simple horizontal line is the home’s largest form, a living room, community space, which opens onto the horizon and is set between entry and kitchen. Bedrooms and bathrooms are tucked on the other side of horizontal line which that divides public/private space on the ground floor. Upstairs is a balcony and children’s playroom. • 2 bedrooms/ 1 bathroom plus loft. • Simple eco-conscious design focuses on functionality and creates a healthy living environment for the family. 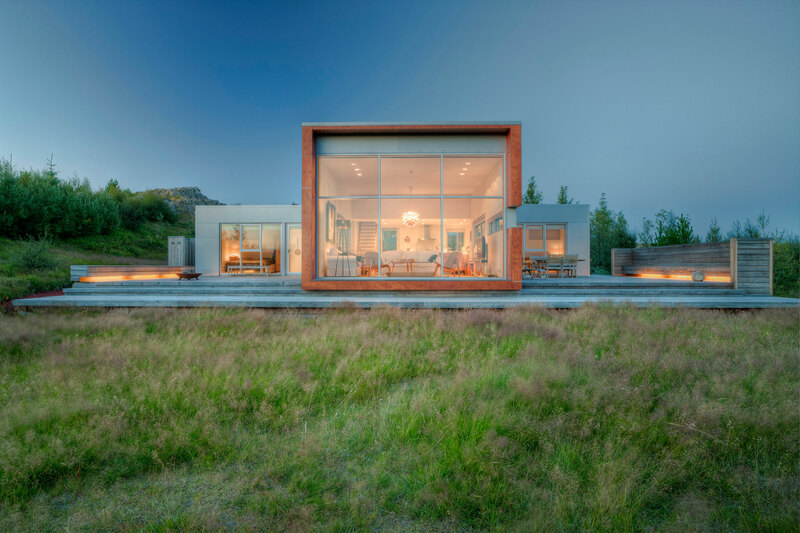 • Integrates the building within the landscape, the home blends within the environment’s “body”. • Design elements were chosen carefully to maximize passive solar power and cross ventilation, minimizing electricity costs. • Conscious effort made to use materials in their most organic form. • The project reduces its impact on the natural ground by raising the structure with elevated decks and floors. • Native wood siding materials are locally sourced, which allows for the project to blend in with the surrounding regional landscape. • Large and expansive windows and openings are used in living area and bedrooms to provide abundant natural light, frame the beautiful landscape and enable a seamless connection with nature. 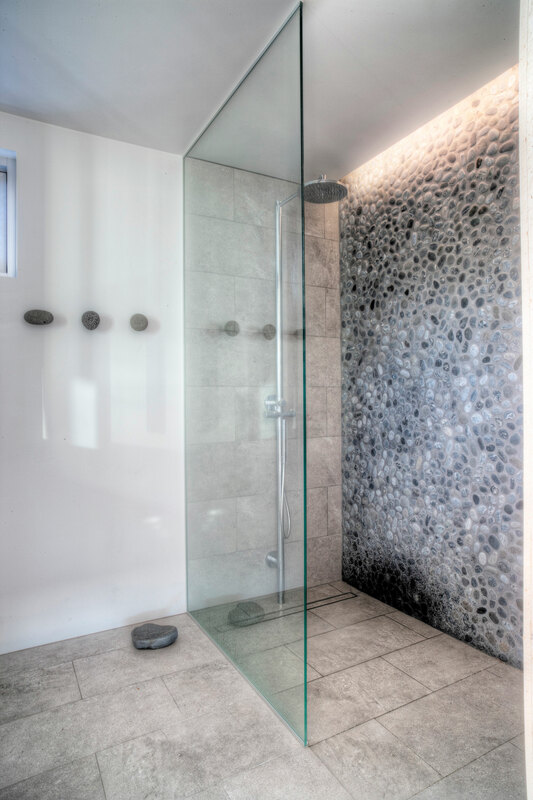 • Master bathroom features a pebble rock wall referencing the surrounding landscape. • Exterior spaces designed for maximum indoor-outdoor living. 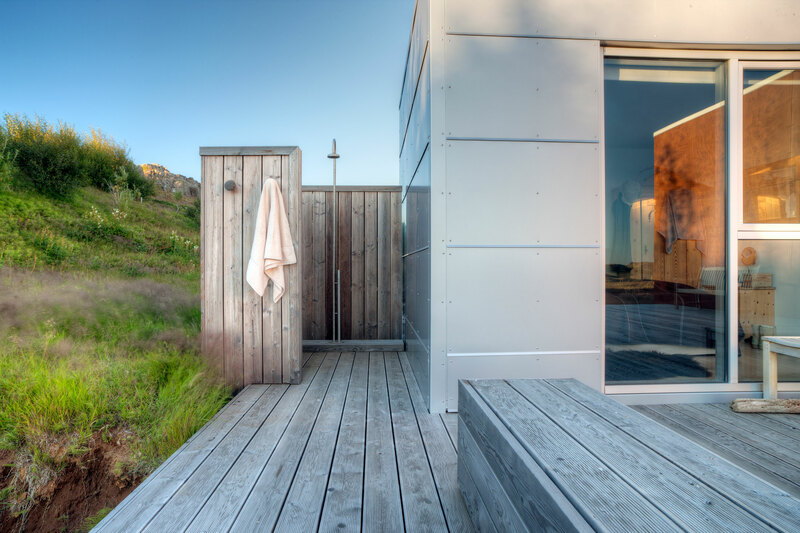 • Outdoor shower encourages a closer connection to nature and the elements. • An edible garden is incorporated into the exterior design to foster sustainable living. • To improve indoor air quality, no carpet or forced air systems (AC/HV) utilized.